Federation of Indian Granite & Stone Industry (FIGSI) has been working since 1983 for their progress and scientific development as well as in removing obstacles to achieve rapid and constant growth.Over the years, it has successfully created maximum awareness in the international stone markets for exotic Indian stones and brought continuous interaction between Indian ornamental stone industries and world stone trade. The principal objective of the association is promotion of the Natural Stone Industry to the benefit of its members and the Nation. Our association endeavours to act as a bridge between Industry and the Government in bringing constant improvement in mineral regulation, policies, processes, systems and procedures. It pro-actively promotes up gradation of technology aimed at mine safety, productivity, cost efficiency and quality improvement. It is initiating to start an Institute for Research & Development as well as training to benefit the industry. All along, the Association has been very aggressive in taking the problems to concerned authorities, knocking the doors of the lowest to the highest and solving them by getting positive and favourable action to help and augment India's stone trade. Federation of Indian Granite & Stone Industry is a Non Profit Organization registered under Karnataka Societies Act during March 1983. For over 30 years now, the Association is serving India’s Natural Stone Trade & Industry. It has over 783 members on the rolls as on date. The Association acts as a bridge between the Industry and the Government at various levels. The objective of our association is to promote natural stone industry in India with focus on attracting investment, promoting employment, expanding the market and upgrading the technology application and promotion of exports. 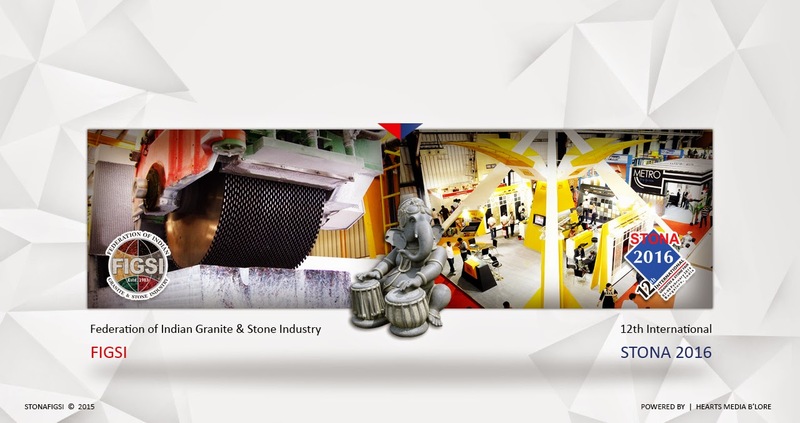 Main Objective of the Association being Promotion of the Natural Stone Industries, which come under the category of Ornamental or Decorative building stones like Granites, Marbles, Sandstones, Slates, Quartzite etc., and ancillary and auxiliary industries of Machinery, Tools, Abrasives, Consumables related to stone industries and conduct conferences, workshops on each and every aspect of stone industry. With the progress of industry, a need was felt to organize International Stone Fairs as early as 1985 / 86. First ever International Granite and Stone Fair STONA 87 was thus organized in 1987. It was the First Ever International Stone Fair in the whole of Asia and well represented by Indian as well as overseas participants. Since then 10 International Stone Exhibitions were conducted in Bangalore which was well attended by the entrepreneurs from all over the world. The Indian Stone Exports which was at about Rs. 50 crores per year in the year 1987 when the first Stone Fair was held has crossed Rs. 7000 crores after STONA 2012 which clearly shows the role of STONA fairs in the promotion of the Indian stone Industry. Recognizing the services of the Association, FIGSI has been taken in various committees formed by Government of India for the betterment of the Stone Industry of India. Following are the major committees in which FIGSI has been given a chance to serve. 1. Granite development Council : The important committee formed to look into the various aspects of the stone industry, which is having members from State Governments of Karnataka Tamilnadu Kerala, Orissa, Rajasthan, Gujarath, Andhara Pradesh, GSI, IBM, FIMI, FIGSI and selected big industry representatives. In view of the efforts of the FIGSI, GDC formulated the Granite conservation and Development rules (GCDR- 1999) which was gazette in 1999. This has become a boon to the mining industry by having provision for long term lease which already many of the State Governments have started implementing. 2. Group of Marble Development : This committee was also formed by the Ministry of Mines, Government of India which drafted the rules for the Marble Mining Industry in line with Granite Industry. In this committee representation from Rajasthan Gujarat, GSI, IBM,FIMI and FIGSI was there . The Marble conservation and Development 2002 was formulated in the year 2002. 3. Planning Commission : Every 5 years, the planning commission proposes the future plan for the next five years. In respect of Stone Industry, FIGSI along with FIMI and CDOS is preparing the reports and submitting to the Government of India. President of FIGSI was the chairman for the core-group of Non-mineral sector which prepared the report for the 12th Five year plan. 4. FIGSI is in the Executive Committee of SMI, EC ( Sustainable Mining Initiative) which is formed by the FIMI. 5. Apart from the above, FIGSI has submitted memorandum on various issues and problems faced by the Industry with respective State governments and Central Government. 6. The Stone Industry of India especially the Granite and Marble Industry is facing severe shortage of raw material to run the Industry. The growth of the Processing was very fast due to the growth of the demand in the domestic and International market. But the supply of raw material has not grown with the same phase. The restrictive policy of the Government was one of the reason since both the Granite and marble blocks are kept under restrictive items for import. FIGSI has mad several representation to Commerce Ministry, Government of India and also DGFT to bring both the Granite and Marble blocks import under OGL scheme.